This place used to be the pride of Nagercoil. Greatest Bakery is the name of the place and you get the best plum cakes in the southern part of the country in this bakery. 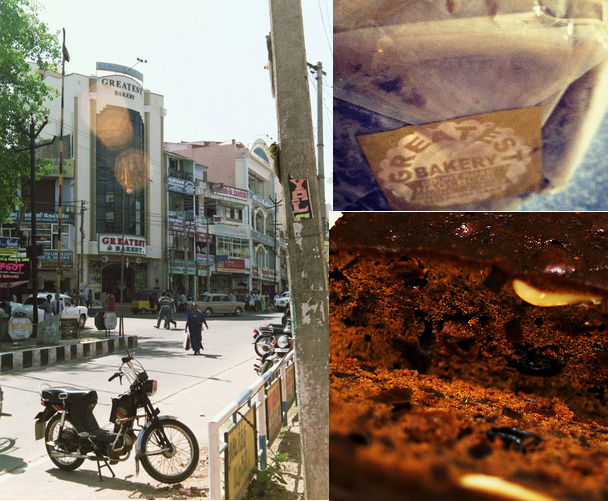 I have tasted plum cakes from this bakery for the last 4 decades and believe me when I tell this - I long for December to just have a bite of the plum cake. Nowadays the old taste is not there. Still, the bakery is known for its plum cakes. In the year 2006, my friend Martina came home to celebrate Christmas with us. When I started talking about Greatest bakery, she told that she was an expert in making plum cakes. That year, I decided to try the cakes she baked. So she went into the kitchen and started baking plum cakes. Everything was going well. But when she took a bottle of rum from her suitcase and frisked it into the kitchen, I followed her into the kitchen and confronted her. She convinced me saying that the rum she was gonna add to the cake is her secret ingredient. Since she spoke like an expert, I left the kitchen with hopes of tasting the best plum cake I had ever tasted. That evening, when she brought a tray full of plum cakes, my mouth watered and I readily grabbed a couple of cake slices and before my parents could even take a piece, I ate them. The cake tasted like idli dipped in honey and tomato sauce. Within a few minutes, I was dizzy and my eyes automatically shut. When I opened my eyes, it was the next day afternoon. Apparently, the cake intoxicated me and I was sloshed for more than a day. Martina was nowhere to be seen. This year, when my wife told me that she was gonna bake plum cakes, I told her that I was not taking any risks. I am going to have my plum cake fro Greatest Bakery. In the meantime, Martina has started a cookery blog and also has an FB page. I am not sure how many people she is gonna intoxicate this year. Note: I am not gonna reveal Martina's original name as she has invited me to her home for dinner. I don't want her to poison me yet again.